Extend the default Magento 2 order management functionality with the ability to delete orders. Erase unnecessary orders and related information or move them to archive. Set automatic order grid clearance periods to keep it up-to-date. By default Magento 2 doesn't allow store admins to remove or somehow hide the unwanted orders. That's why to keep your order grid clean you will need a solution. Magento 2 Delete Orders programmatically removes unnecessary orders. Moreover, the module enables you to archive some orders to have the ability to restore them later. With the Magento 2 Delete Orders extension, you can increase your productivity and speed up order processing in the store. Get rid of unwanted orders in two different ways depending on your order policy. Permanently remove orders and related data from the Magento 2 order grid. The action can not be reversed. That's why store admin should double check every order before performing this action. Archive selected orders to the separate order grid to clean up the main one from the unwanted orders. You will have the ability to restore the archived orders later. On top of that, this feature can be automated to save your time. Deleting orders is sometimes not the best practice because you may need certain information later. With the Magento 2 Delete Orders extension you can hide the unwanted orders in the archive where they will be stored until needed. On top of that, you can set up automatic order archiving to save time and avoid routine actions. With the module, it is easy to completely delete orders. However, you can benefit from the order archive as your order data backup can be restored and used in a number of clicks. Hence, archiving orders can become the solution in different situations. All archived orders are placed in a separate grid where they can be stored and will not interfere with active or recent orders. From this grid you can easily recover particular orders and their related information. Move multiple orders to archive, restore them back, or permanently delete many orders at the same time. The extension enables you to apply mass actions to multiple orders in a number of clicks. All order related data will also be affected. 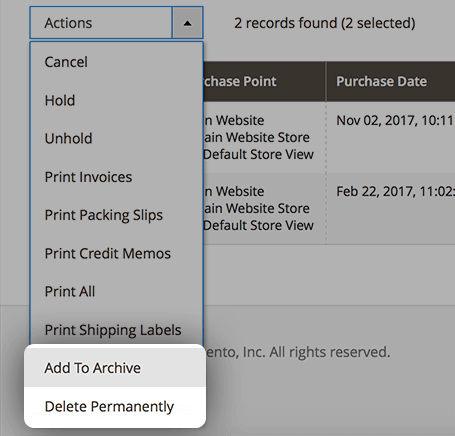 Magento 2 Delete Orders extension enables you to automate some routine order archiving actions. Generally, you can archive orders individually after the certain number of days, by their statuses, or using the established frequency. Specify the period of time in days after which the order should be placed into archive. 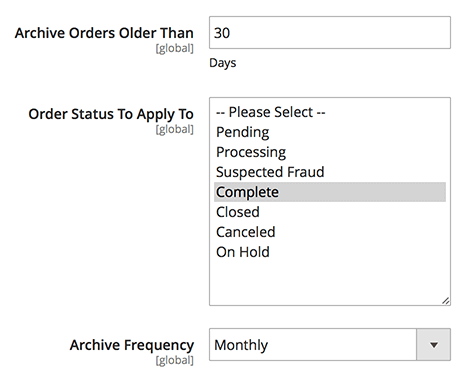 Depending on your needs, you can automatically move orders and related data to the order archive grid after 30, 90, or any other specific number of days. Delete Orders Magento 2 module allow you to send orders to archive on achieving particular status. Define statuses that should trigger the movement and enjoy automatic order archiving for completed, closed or any other required order status. Choose among fice predefined types of an archive frequency. Archive orders hourly, two-times per day, daily, weekly, or monthly. The extension allows you to set up the most suitable frequency for order archive procedures or manually configure cron job actions for any specific archive time. Removing or archiving orders is only the half of the case. The extension lets you hide orders from accounts of your customers to provide them with relevant information about their recent orders. You can modify the Magento 2 delete order status using API. Remove, archive, and restore orders without visiting the admin panel of your store. It's very handy to automatically delete canceled orders and archive complete ones. As the number of orders in sales order grid came down it became much more convenient to browse it and the grid itself loads a lot faster. No installation hassle and works as described. We use it not only to delete oders altogether but also to archive those that we need. It can do the job automatically, so you can just install, configure and forget about periodically cleaning your order grid up. Recommended. In general, the extension works fine, yet in the beginning, I had an issue with deleting orders in bulk. Though this is an included mass action, it didn't work well actually. perhaps, the only thing that could make me less disappointed was the guys on the support team. They were very responsive and really did their best. Since then everything works as it should. But I wish they were perfect on the first try. So just 4, sorry, guys. – Fixed issue with mass action "Delete permanently".